Jonas is a seasoned artist who has been a full time touring musician for over a decade sharing the stage with the likes of Jars of Clay, Mute Math, Leeland, and many others. 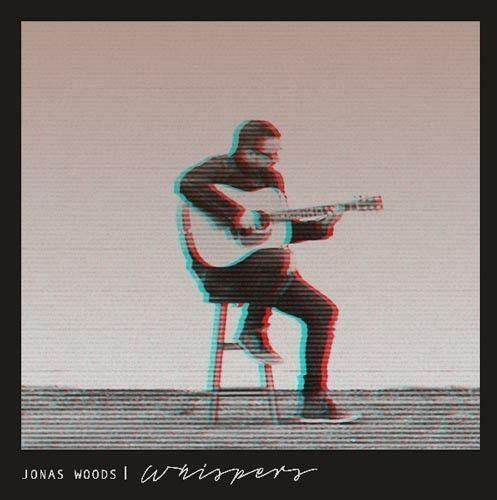 “Whispers” is produced by Chris Hoisington and shows the diversity of Jonas’songwriting and talent wrapped up in the indie sound that has become the signature of Old Bear Releases. The first single from “Whispers” titled “Hold My Tongue” impacts all major digital platforms on February 22nd, 2019. The entire album will be available for purchase at the Old Bear Records online store on March 15th, 2019 followed by its release to major digital platforms on April 19th, 2019. 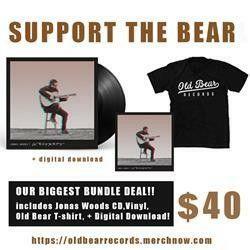 Jonas Woods is another of Old Bear Records growing roster of artists. He has been in the music industry for many years, initially as founder and frontman of a band called Farewell June. Now though he tours with his wife supporting him, both with the family and on stage. Jonas has two previous solo albums and two with his former band, so he is no stranger to the recording studio. "Whispers" is his first album with Old Bear Records and is a more personal collection of songs about experience. The album starts off gently with "The Light Is Always On", the acoustic guitar being the prominent instrument as the lyrics paint a picture of one of his kids. This is a really warm song as he describes some of the antics of the older of his boys during the day, snippets of life that any parent will recognise and he talks about his son playing in his Batman mask and his underwear. There is a joy in this memory, but the takeaway is that "monsters can't stay when the light is on, and the light is always on." This is about a parents love and guidance for their kids, then it switches around for the next track "Love is Patient". As an adult he is falling back on his parents when he is in a difficult position. This leads to a chorus of the love passage from 1 Cor 13 where Jonas voice is backed by his wife which sounds amazing, he remembers that love never gives up on us. The earthly love is only a reflection of God's love for us. Family is an important factor in many of these songs and there are elements of this that come through in other tracks like "Paper Kites". Aside from the parental and familial ties there are songs on this album that are about romantic relationships. "Totally Still" is one of those where accompanied by piano, but no guitar, is about the fall-out after an argument and he is musing about the times when he speaks out, but often he just stands totally still. Instead of arguing, or even just standing there, why doesn't he spend his time better, showing his partner the love that he has and feels for her. This is a beautiful love song and probably a lot of guys would find themselves nodding along with Jonas in this track. "Because A Girl Loves A Boy" gives us a more traditional love song, complete with a crooner style, imagine something in a black and white, or maybe even early Cliff Richard in The Young Ones era. That's not to say that there aren't modern cultural references in there, comparing their love to "flying high like Lois and Clark", and if you haven't got it, that's Superman! The Big Band sound never goes away, Robbie Williams recent career is a testament to that! I would love to hear a whole Christian album of this. In all relationships whether kids, partners, parents or any other friendships or personal interactions there is advice in blues track "Hold My Tongue". This isn't about not speaking, well not exactly anyway, this about your actions being greater than what you speak and showing your love and honour with what you actually do. Words are cheap, actions definitely speak louder. This is a great track that is very different from anything else on this album and you definitely need to listen to this if you love a bit of blues. Alongside these tracks about our relationships on earth the spiritual is weaved through them, but there are some songs that are more about the spiritual parts of life. "Words" is a beautiful song of dedication and commitment. With simple backing, this is about someone offering to God to go and do what he is called to. This is about the words that God speaks, the promises that are given in the Bible. These mean that we can face the situations that God wants us to despite our own anxiety because we trust in the authority and assurances that God has given us. The title track(s) "Whispers" speaks of those times when we are down and defeated and feel broken, when the world is all too prevalent. It is then that we hear the whispers from God's heart to soothe our mind and soul. This song talks about the changes when we hear that still small voice of God. This song has the main track and then a shorter track called "Whispers part B" which takes a little of the story of Elijah when he spoke with God at Horeb. This building track talks about God not being in the Earthquake, or the fire, but God is found in the whispers, in the quiet. This leaves the album on a real high point as it builds up and suddenly finishes. There are probably more layers in that last couple of minutes of this track than the whole of the rest of the album! With no experience of Jonas prior to listening to this album I didn't know what to expect. The early parts of this album mostly focus on the acoustic guitar and the vocal and that's good because it establishes the tone. It shows off the great warmth in Jonas' tone and the great harmonies with his wife on some of the tracks too. I was lulled into a false sense of security though by these tracks, which were very pleasant, but then everything changed with "Hold My Tongue". As it starts the guitar riff is still the only sound, but that track just builds up that sound as more instruments get added. This really shows the versatility of Jonas' vocal because it sounds brilliant. Then they shock the listener who may not be expecting it by completely changing the style again with the smooth crooner style! This album may not rate high on the JPM (Jesus Per Minute) scale, but the lyrics and songs weave the spiritual into the real moments of life. It makes a change to get some of these types of tracks on a Christian album, but I have really enjoyed it and if your interest is at least piqued then I believe that you will love it too.